Rupture of an abdominal aortic aneurysm is one of the leading causes of death. The risk of rupture has been a controversial topic for years and only recently have population-based studies provided better evidence for clinical management. 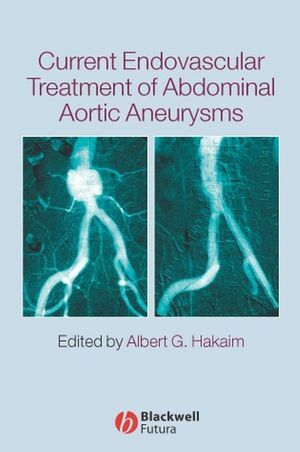 This book includes material by an internationally renowned group of authorities directed by a prominent vascular surgeon at Mayo Clinic. The contents represent a well-balanced clinical endovascular approach to the exciting area of vascular medicine and surgery. Dr. Albert G. Hakaim, MD, FACS. Consultant, Section of Vascular Surgery and Director, Endovascular Surgery, Mayo Clinic, Jacksonville, Florida; Associate Professor of Surgery, Mayo Clinic College of Medicine, Rochester, Minnesota. Part I: Preoperative and Operative Considerations. 1. Long-term outcome following open repair of abdominal aortic aneurysms (Audra A. Noel). 2. Durability of Endovascular repair of infrarenal aortoiliac aneurysms: what lessons have been learned (Josef Klocker and Albert G. Hakaim). 3. Imaging techniques and protocols for endovascular repair of abdominal aortic aneurysms (Ricardo Paz-Fumagalli J. Mark Mckinney, and Andrew H. Stockland). 4. Essential operating room equipment, personnel, and catheter inventory for endovascular repair of abdominal aortic aneurysms (Peter A. Schneider and Michael T. Caps). 5. Essential interventional suite design, equipment, personnel, and catheter inventory for endovascular repair of abdominal aortic aneurysms (Eric Huettl, William M. Stone, and Richard J. Fowl). 6. Diagnosis, management, and prevention of atheroembolization and contrast media-induced renal insufficiency during endovascular repair of abdominal aortic aneurysms (Andrew Wasiluk and William E. Haley). 7. Anesthetic management for endovascular repair of abdominal aortic aneurysms (Monica Myers Mordecai, Perry S. Bechtle, and Bruce J. Leone). Part II: Commercially available stent graft systems. 8. Commercially available endovascular stent grafts (Timothy A. Hipp and Albert G. Hakaim). 9. Ancure endograft (Thomas C. Noslund). 10. AneuRx stent graft system (John W. York and Samuel R. Money). 11. Excluder bifurcated endoprosthesis system (Eric T. Choi and Gregorio A. Sicard). 12. Zenith AAA endovascular graft (Beate Neuhauser, W. Andrew Oldenburg, and Albert G. Hakaim). 13. PowerLink stent graft system (Edward B. Diethrich). Part III: Investigational Stent Graft Devices. 14. Lifepath AAA bifurcated graft system Sashi Kilaru and K. Craig Kent). 15. Talent LPS endoluminal stent graft (Sherry D. Scovell, Lisa Jordan, and Roy K. Greenberg). 16. Balloon-expendable stent and polytef-based endograft for repair of complex and ruptured abdominal aortic aneurysms (Takao Ohki and Frank J. Veith). 17. Custom Dacron-stainless steel stent grafts (Albert G. Hadaim and Timothy M. Schmitt). Part IV: Intraoperative ancillary procedures. 18. Use of intravascular ultrasonography in endovascular intervention (Jonathan D. Woody, George E. Kopchok, James T. Lee, and Rodney A. White). 19. Intentional occlusion of the internal iliac artery to facilitate endovasuclar repair of aortoiliac aneurysms (Alfio Carroccio, Peter L. Faries, MIchael L. Martin, Osvaldo Juniti Yano, adn Larry H. Hollier). 20. Arterial access for endovascular aneurysm repair (Timothy A.M. Chuter). 21. Ancillary interventions to provide proximal and distal endograft fixation (L. Louis Lau, and Albert G. Hakaim). 22. Prevention, diagnosis, and management of endoleaks (Srinivasa Rao Vallabhaneni, Martin Malina , Bjorn Sonesson, and Krassi Ivancev). Reporting standards for endovascular aneurysm repair (Albert G. Hakaim).